SetBreaker (iTunes Link) is a remarkably simple, yet challenging iPhone game designed to keep your mind sharp. 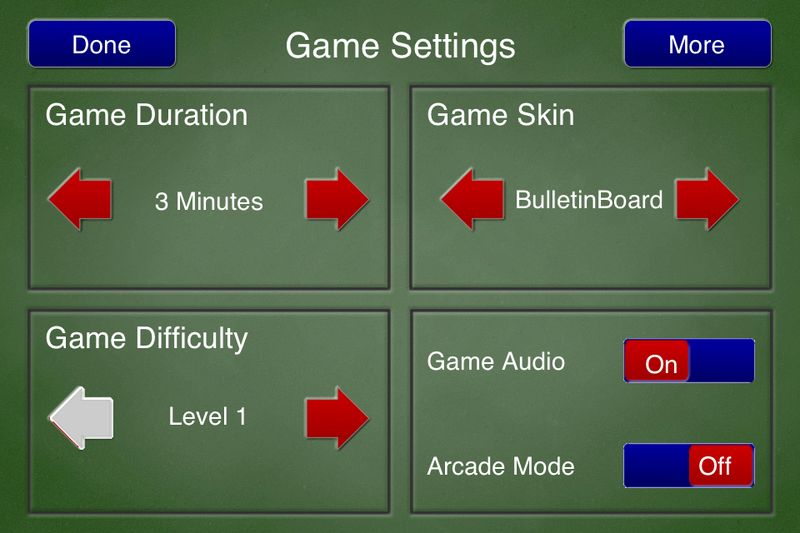 Developed by EzEz Apps LLC, the object of the game is to figure out which item in a given “set” does not match the other three objects. Using a combination of phrases, math problems, words, and symbols, SetBreaker trains your mind to make decisions as quickly as possible. The quicker you choose which of the four options in the set is wrong, the higher your score is. Each game lasts for 3 minutes, and you have 15 seconds to determine which item breaks the “set”. If you correctly answer consecutive questions you can get combo bonuses, also improving your score. To add another twist, sometimes all four items in the set match the given category. In this case, you select “ALL MATCH”. If none of the items match, choose “NO MATCH”. 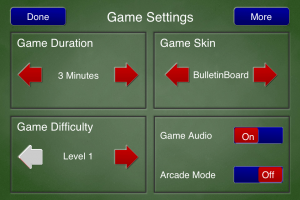 The “Settings” screen allows you to adjust the length of each game, the appearance of the game, difficulty (levels 1-3), game audio, and arcade mode. Arcade mode displays small objects such as snowmen in various places around the screen. Tapping these objects gives you bonus points. I’ll admit I became exceedingly frustrated with the game because it seemed as though there were some categories which didn’t make any sense whatsoever. As I continue to play the game, I’m finding it a little easier to understand. This could be a turnoff for people who easily become frustrated while learning a new game. SetBreaker is a wonderful game for exercising your brain. Not only is it fast-paced, but it is also highly addicting and exciting. You’ll find yourself striving to achieve better scores while sharpening your observation and judgment skills. According to the developer, future updates of the app will include Game Center support and head to head gameplay. SetBreaker (iTunes Link) is compatible with iPhone 3GS, iPhone 4, iPhone 4S, iPod touch (3rd generation), iPod touch (4th generation) and iPad. Requires iOS 5.0 or later. A small expedite fee was paid by the developer to speed up the publication of this review.